confession: i am watching new moon. i feel like i'm cheating on eric from 'true blood' with edward. when you are a stay at home mama you have to live vicariously through someone..
but i have another confession: i'm not folding laundry. i'm party planning. for birthdays in may & september. i LOVE to plan a party. my best bud & i daydream about being party planners. we both LOVE to party. from the invites to the favors, food, decorations & games. i become a slight bit obsessed over the whole thing. 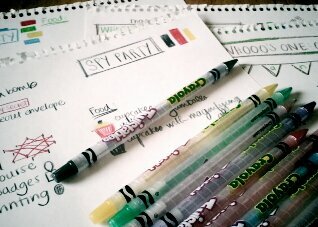 i borrowed the dude's colored pencils & doodling pad..
& have been jotting down ideas for parties. the dude was set on a spy party..
even said he wanted a hat & a long coat 'that went down to here & had buttons' for it. then this morning he says he wanted a lego party. i'm even working on ideas for the babe..
who isn't even 6 months old yet. i have to actively make myself hold off until january to party plan. i'd REALLY be in trouble if i had a daughter. twice as many ideas & cute things..